Here is an unofficial translation of the English language translation of the Action plan of the National IP Strategy (2014 -2020) (NIPS), about which I previously blogged. 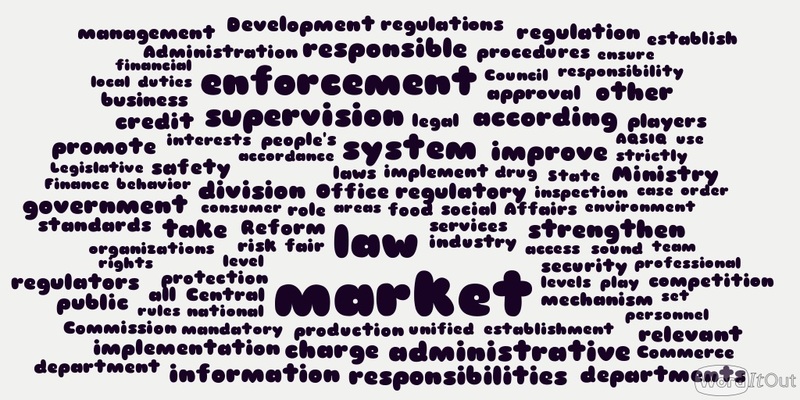 A wordcloud from this English translation is above – with an obvious focus on “management,” “strengthening,” “promotion” and “enforcement” and some mentioning of the “market.” As the NIPS was released just weeks after the Fourth Plenum, it make a useful point of contrast on where China is headed on IP, including IP-related rule of law. An annotated version of the Fourth Plenum decision is available here for comparison. For those with short attention span, or a strong visual orientation a wordcloud of the Fourth Plenum decision is found at the end of this post. In short, the Fourth Plenum is emphasizing the “market,” “law” and “enforcement.” The NIPS, however, seems to be all about strengthening the IP system. Regrettably, the NIPS keeps some of the failed metrics of its first implementation in place. Patent filings will increase from 4 per 10,000 people in 2013, to 14 per 10,000 in 2020. This means that SIPO will be receiving in excess of 6 million patent applications per year. In an implicit recognition of the problem I have noted that patent maintenance is at least as important as patent applications, the NIPS also wants to increase the average maintenance period for invention patents from 5.8 years to 9.0 by 2020. However this data point doesn’t resolve the problem of low maintenance rates for utility models and designs and it is to be hoped that in all cases, maintenance rates expand due to growth in the market and not due to the kinds of artificial subsidies that already plague China’s patent applications. Among the market oriented targets, export growth in IP rights is also slated to grow from 1.36 billion USD in 2013 to 8 billion USD in 2020. 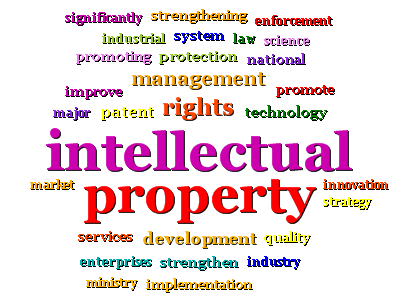 Commercialization-related goals reflect the goals of the Third Plenum, to increase IP utilization generally. “Reform systems for judicial organs’ personnel and finance management, explore the implementation of separating courts’ and procuratorates’ judicial administrative management affairs and adjudication or procuratorate powers. Conclusion: It should come as no surprise that the Fourth Plenum, although more general, may more greatly impact IP-related judicial / legislative issues. Based on a recent trip to Beijing, I understand that work is already underway to draft IP provisions of a civil code. The new chief judge of the Supreme People’s Court IP tribunal (Song), the new Chief Judge of the Beijing IP Court (Su), the new Vice President of the SPC with authority over the IP tribunal (Tao) all have civil law backgrounds. In addition, consideration is being given to the specialized IP courts having a circuit court type role. New technology assessors in the IP courts will affect the way that evidence is considered and will likely enhance the independence and professionalism of the courts. This entry was posted in Data, Don Clarke, Fourth Plenum, Government & Regulations, Licensing, Maintenace Rates, National IP Strategy, Rule of Law, Technology Assessors.